Well I bought a set of tow mirrors and after having the running and signal lights on my standard mirrors, I wanted to do the same to my tow mirrors. I don’t have pictures for the whole process so you may need to use your imagination. Then I took the mirrors off. You have to take off both flat and convex mirrors to get to all the screws. To get them off use a small, long flathead screwdriver to pop the clips. Patience is key. Once the screws are out, take the front and rear halves of the mirror apart so you can drill for the lights. I placed my lights as far to the outside centered between the 2 telescoping arms. Be sure to measure multiple times to ensure both sides are identical. I then used a step bit to drill just big enough for the wires and plastic extension to fit through. Clean the surface, take the adhesive off the back of the light and press for a bit to ensure a good bond. I already had wires with running light power run into my door so I didn’t have to worry about that. To run the wires into the mirror was another story. The stock wires wind through the mirror in a weird way that I couldn’t get another wire through so I decided to drill a small hole through the aluminum backing (behind the foam that goes up against the exterior of the door). I drilled in the hole one spot towards the rear of where the harness plug is. This way the wire pops out in the middle between the two arms and can be routed easily into the mirror and connected to the light. The ground can be connected with the ground for the rest of the mirror functions. Now for the interesting part. 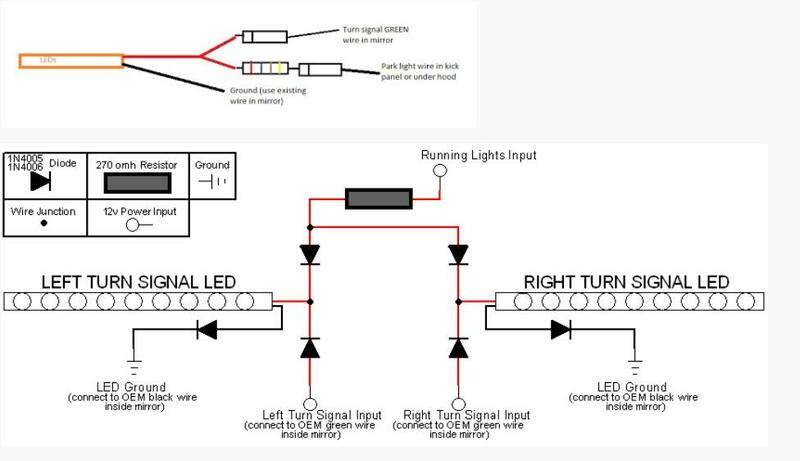 To have both running lights and turn signals with only 1 LED light, you have to do a bit of wiring. I found these diagrams that explain it very well. The first picture is not labeled very well but there are 2 diodes and 1 resistor. 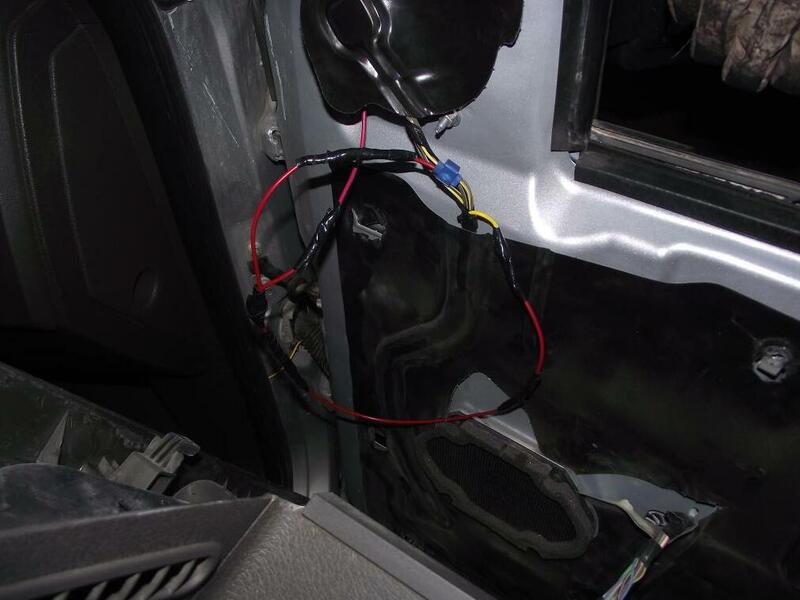 I used the first diagram since I installed the wiring in my doors. This is how I installed it in the doors. I taped everything up and tucked the wires away so that there are no rattles. Here is a short video of it all finished. Let me know of any questions and I’ll try to answer them. I’ll also try to take some pictures of it finished as the ones I did take were too dark to see much.